LONDON (Reuters) - The father of American actress Meghan Markle said on Tuesday he could not attend his daughter's wedding to Britain's Prince Harry on Saturday because he needed a heart procedure. Thomas Markle, who lives in Mexico, was quoted as telling Los Angeles-based celebrity website TMZ.com that he was scheduled to undergo a heart repair and blockage clearance procedure early on Wednesday morning. Markle, 73, was due to walk his daughter down the aisle in front of 600 guests including all the senior British royals and a smattering of celebrities. Markle threw the wedding plans into confusion earlier this week when he said he would not attend the May 19 nuptials because he did not want to embarrass his daughter or the royal family after reports he had staged pictures with a paparazzi photographer for a fee. He also said he had been hospitalized after suffering a heart attack a week ago. Harry, 33, Queen Elizabeth's grandson and the sixth-in-line to the British throne, and Markle, 36, will marry on Saturday at St George's Chapel in Windsor Castle. On Tuesday, Markle told TMZ that he hated "the idea of missing one of the greatest moments in history and walking my daughter down the aisle." But he later said doctors had scheduled surgery on Wednesday morning. "They (doctors) will go in and clear blockage, repair damage and put a stent where it is needed," Markle told the website. Kensington Palace, Harry's office, could not immediately be reached for comment on Tuesday. But in a statement issued on Monday it said called Thomas Markle's comments "a deeply personal moment for Ms Markle." "She and Prince Harry ask again for understanding and respect to be extended to Mr Markle in this difficult situation," Kensington Palace said. The bride-to-be's parents are divorced and while Harry has been pictured with her mother Doria Ragland, 61, there had been speculation about how Thomas Markle, a former lighting director for TV soaps and sitcoms, would feature. However, Harry's communications secretary told reporters last week he would have an important role and would give away his daughter on the couple's big day. He had also been expected to meet the queen, her husband and the other senior members of the Windsor family this week. Thousands of journalists from across the world are descending on the genteel town of Windsor for the wedding, and Thomas Markle told TMZ earlier this week that the media attention had taken its toll. He said he had been offered up to $100,000 for interviews and been ambushed by paparazzi whose snaps had shown him buying beer and looking dishevelled. TMZ said he had agreed to the staged pictures, which showed him looking at images of the couple on a computer and being sized up for a suit, because he hoped they would improve his image. Prince Harry and his elder brother Prince William have both made clear in the past their dislike of the press, fuelled by the death of their mother Princess Diana in a Paris car crash in 1997 as her limousine sped away from chasing paparazzi. Kensington Palace has limited press access to the ceremony itself and strictly controlled the release of details about the wedding to the media. 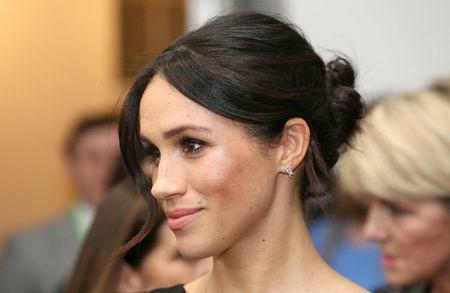 If her father does not come, British newspapers suggested that Markle's mother, with whom she is spending the night before the ceremony at a nearby luxury hotel, would walk her daughter down the aisle.